SILHOUETTES - Chattanooga Alumni Chapter Kappa Alpha Psi Fraternity, Inc. The Organization, formerly known as National Silhouettes came into existence because of a need. Many wives accompanied their husbands to the Grand Chapter of Kappa Alpha Psi and found themselves alone and in need of activities to fill their time. 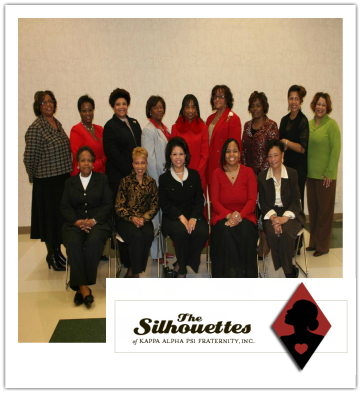 Later, the Kappas asked their wives to act as hostesses and plan activities for visiting wives and children. Many such groups remained together and organized permanent groups, calling themselves "Kappa Wives" or "Kappa Alpha Psi Silhouettes". could be discussed. An announcement of the meeting was put in the Kappa Alpha Psi Journal. On December 31, 1946, a group met at the home of Mrs. Harold L. Edgehill of New York for the purpose of laying groundwork for the formation of the National Organization of Kappa Silhouettes. At this meeting, the committee present suggested the formal name of Kappa Alpha Psi Silhouettes. It was decided that the group would elect officers at the California meeting in 1947. Their were volunteers from Philadelphia, PA. Detroit, MI, Topeka, KS. Columbus, OH. and New York, NY. to serve on the committee. The formal organization of Kappa Silhouettes became official in August of 1947, at the Kappa Alpha Psi Fraternity, Inc., Conclave in Los Angeles, California.